On this first day of the first month of 2012 (raining as if it were monsoon), I am thinking about the chat my hubby and I had last night: new years' resolutions and all. So, I came across the wonderful blog that is My New Roots. The best healthy, wholesome, yummy eating blog I have ever read. One feels healthy just reading it! plus I know exactly what's in it - and it's so scrummy. This is how I made it, but actually, you can "build" your Granola any way you like, adding or taking away ingredients as you please. First, preheat the oven to 175 degrees C.
Mix all the above ingredients into a large bowl. Heat up the Sunflower oil in a small pan with the Maple Syrup (Honey or Agave). Once this has heated, pour the liquid into the bowl of ingredients. Stir them together, until all the ingredients are coated in sunflower oil and maple syrup. Put the mixed ingredients onto a baking trey lined with baking paper and stick it in the oven for aout 10 minutes (until the top layer turns golden brown). 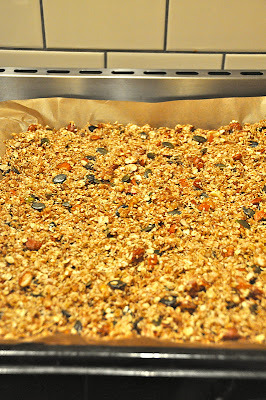 Then move the granola around the trey a bit, so that the ingredients at the bottom of the trey are at the top and bake for another 5 minutes. 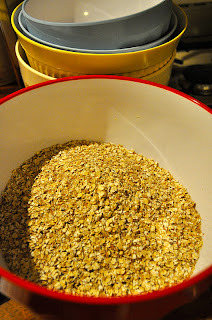 Repeat this process until all the granola is nicely roasted, golden brown and smells yummy. or any other dried fruit you like. I made kilos of the stuff, stored in a large jar, ready for morning breakfast or afternoon snacks. Enjoy a healthy step in the right direction. cant wait to try it ... hugs!